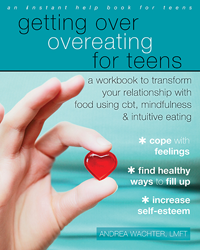 Written for teens who struggle with overeating, binge eating or body image, Getting Over Overeating uses an integrated approach that includes mindfulness, cognitive behavioral therapy (CBT) and intuitive eating. Parents and health professionals can also utilize the language and activities to help the adolescents they are concerned about. Readers will come to better understand the root causes of overeating and learn skills such as emotion regulation, assertive communication, moderate eating, and how to handle cravings. Most importantly, they will find healthier ways to fill up and apply what they’ve learned to live a happier and more balanced life. Use the code Andrea10foru for $38 off an unlimited online CE package or for $10 off any single course! This book is for kids who struggle with body image. Included is a fairy tale about a “Mirror Witch” who puts a spell on children, getting them to hate their bodies. 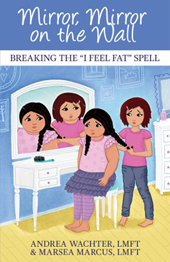 There are 22 chapters, or “Spell Breakers,” which empower kids to question and change their thinking while learning how to love their bodies and break the “I Feel Fat” Spell. While this book was written for kids, we have also discovered that many adults are finding it to be extremely helpful, if not life-changing. Use the code Andrea2016 for $38 off an unlimited CE package or Marsea2016 for $10 off any single course! This unique workbook is full of in-depth information, moving personal stories and insightful writing exercises to help people understand and resolve their food, weight and body issues. 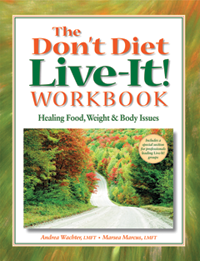 Individuals and groups, world-wide, are using The Don’t Diet, Live-It Workbook as a healing guide and now you can too! Reviews for Don’t Diet, Live-it!